Windows Movie Maker is a free application from Microsoft, that enables you to easily create, edit and share home made movies on your computer. 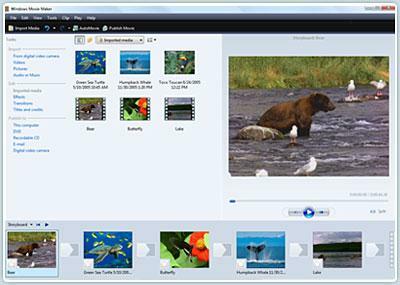 Windows Movie Maker comes with a user-friendly interface and numerous useful features that are easy to use by anyone. - Contains professional-quality video editing options such as transitions, special effects, add titles/credits, add narration, add music and many others. - Several panes are available for different kinds of tasks. - Edit your video using the two view modes available: Storymode and Timeline. - View specific clips or an entire project in the Preview Monitor. - Publishing options for your finished projects include e-mail sharing, DVD/CD burning and others. - Movies can be saved in multiple formats. An effect rack of VST-plugins.